Yesterday's post marked the end of my 365 project. I found many good things in the project--patience, persistence, the value of doing something for the sake of a larger goal without resenting the smaller actions. I practiced self-forgiveness in allowing myself skip days and don't feel even a little bit guilty over doing things at my own pace. I took some fantastic pictures as well as some passable ones and even though some of pictures were motivated by nothing more than "Oh nuts, it's bedtime, what's close by?" I have a difficult time finding them in the lineup. Looking back over the year shows a variety of milestones (both big and small), discoveries, history, and newfound habits. It's a pretty good representation of our life in this house. This project motivated me to always carry my camera with me; it has made photography a daily part of my life in a way that it wasn't before. Several of you have asked "What's Next?". 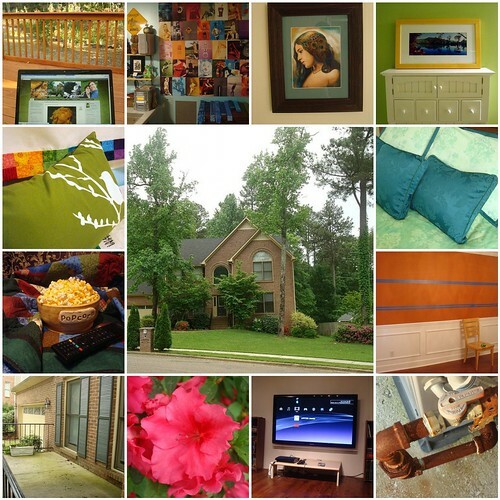 This project helped me establish the purpose of this blog--to share my home and hobbies. I will continue to post recipes, show off my latest quilting projects, and, of course, talk about the house. Many of the same things the 365 project covered--updates to the decor, new furniture or art, small things that caught my notice--will continue to be featured, they just won't be a daily focus. One thing that I am really looking forward to is the freedom of moving away from the 365 format. I set up the "picture followed by a short description" early in the project and towards the end, I began to find it very limiting. Sometimes I felt the story would be better served with multiple pictures, but for the sake of consistency, I refrained. Completing the project means that I can write each post in the way the best compliments the topic at hand. I am also planning on adding more variety--I would like to get back to posting about our CSA membership and begin posting about our local trips and adventures. Completing this project gives me more time and energy to devote to these additional topics. I am excited by the possibilities and hope you are too. I love the collection of pictures you used. :) Very colorful and definitely give a variety of photos of your project. I think those skip days were very appropriate as it's definitely a lot of pressure to take meaningful pictures every single day.